There are disappointingly few movies about wine; I can think of just three. “Bottle Shock”, with the late Alan Rickman, tells the story of the Judgement of Paris that brought Napa wines to the world’s attention. “Sideways”, famous for the throwaway line that unfairly maligned wine made from Merlot. Finally, there is “Walk in the Clouds”, a delightful romantic drama, that suffers with a miscast lead actor in Keaunu Reeves. The breathtaking scenery, the structure of the story, the beautiful Aitana Sánchez-Gijón, and a great performance from Anthony Quinn make it a film worth watching and one that justifies repeat viewing. On a recent visit to Sonoma we decided to try one of the wine tasting rooms around the town’s central plaza. 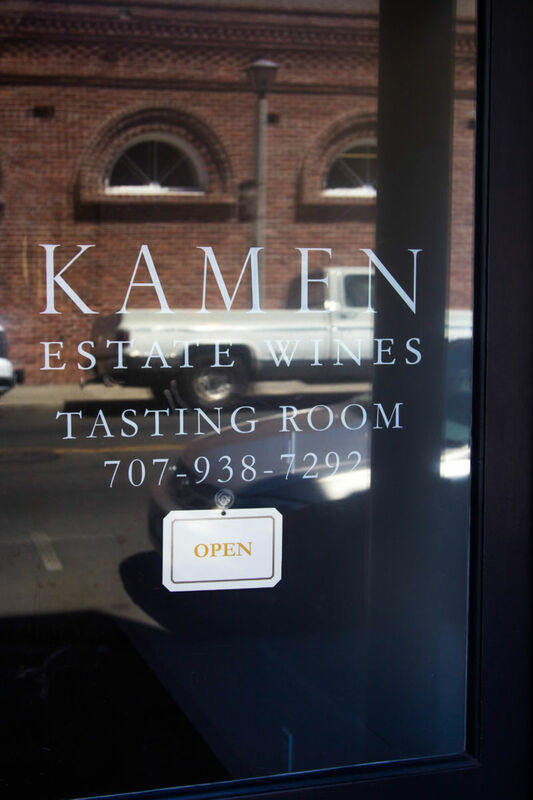 We picked the Kamen Estate tasting room on a whim. We knew nothing about it until we walked in. 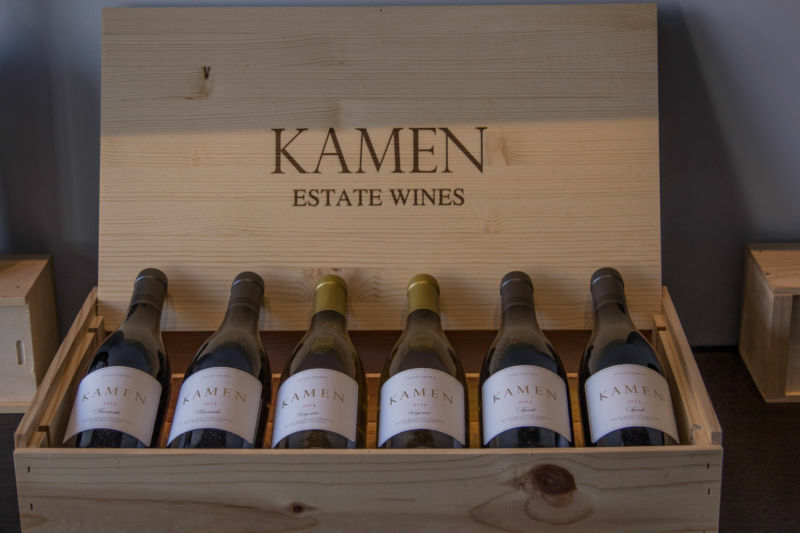 Our server Max soon provided us with background on the Kamen Estate and their wines. The astute reader may be wondering about the relevance of that first paragraph. You may be as mystified as I was when I saw “Wax On, Wax Off” written on a large board behind the bar. That quote is instantly recognisable as coming from the classic eighties movie “The Karate Kid”, not a film associated with wine-making. Max explained that the Kamen Estate is owned by Robert Mark Kamen, a screenwriter whose work includes “The Karate Kid”, “The Fifth Element”, “Taken”, and the previously mentioned “Walk in the Clouds”. The tasting menu offered three wines for a fee of $20. The fee is waived on the purchase of two bottles. The first wine was the 2014 Sauvignon Blanc. It sells for $45. The colour was very pale. The nose was restrained with hints of honeysuckle mixed with the classic smell of mown grass. The wine has a crisp, refreshing, acidity. On the palate I detected apple, honey, and lemon. We then tasted the 2013 Writer’s Block. This retails for $58. 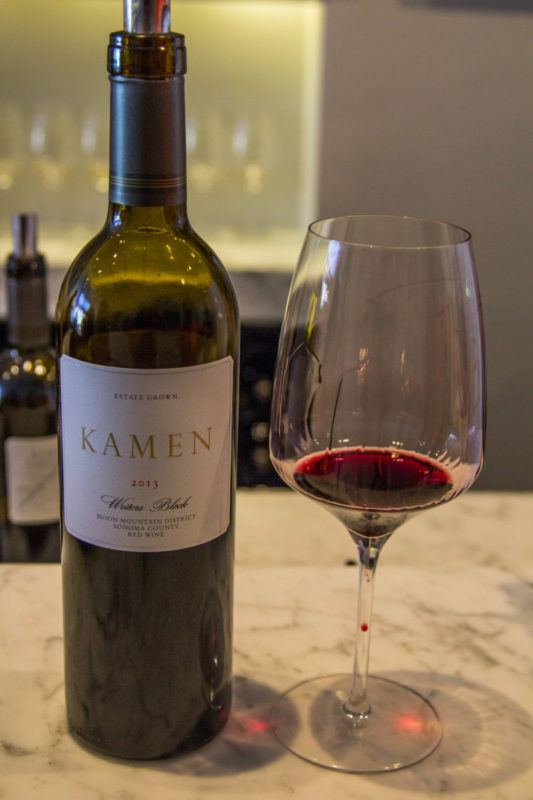 It is a blend of Syrah, Cabernet Sauvignon, and Petite Sirah. Max gave the percentages as 50/30/20. It is a dark, inky red colour. The nose was deep and intensely appealing, with a mix of blackberry and cherry. In the mouth there is a medium plus acidity; with flavours of blackcurrant, pepper, and notes of chocolate and coffee. The wine, though young, is drinkable now. Both California Girl and I loved this wine and we purchased a bottle. The third and final wine was the 2012 Cabernet Sauvignon which retails for $90. The nose was overwhelmingly of blackcurrant The low to medium acidity helped give this wine a surprisingly soft taste. The wine had a taste of mixed berries and black tea. There was a pleasing sweetness at the back of the palate. The wine is already thoroughly drinkable, but should benefit from further aging; their website suggests it should handle enough fifteen to twenty years.